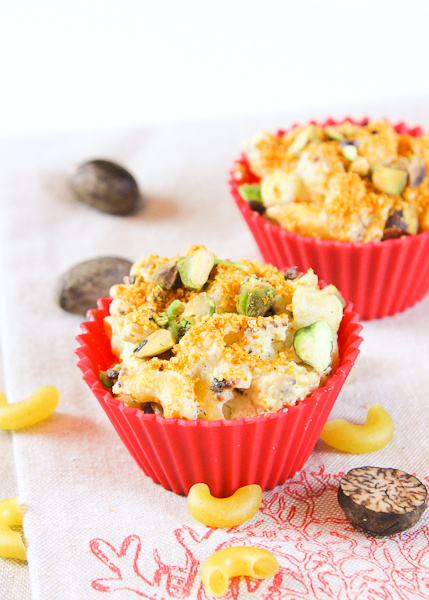 Finally, a macaroni and cheese recipe that is not only gluten free, but lower in carbs, calories, and fat – yet, still satisfies your inner craving with all its cheesy goodness and crunchy crumblies. 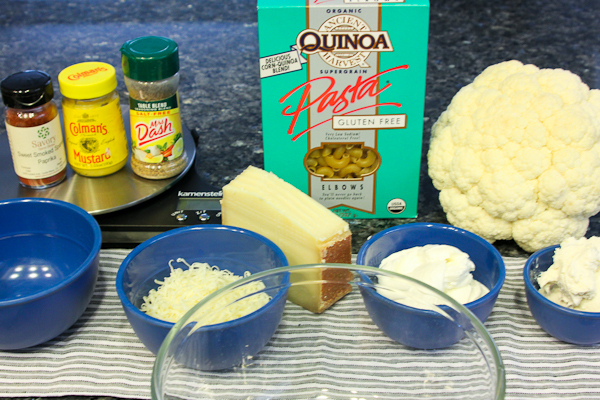 The low carb secret is in the cauliflower – half gluten free pasta and half roasted cauliflower, which adds nutritional value and fiber and can be our secret, if you wish. College Girl will be ecstatic because she, being a normal kid, loved Mac & Cheese (I stocked Annie’s Organic White Cheddar) but has curtailed her consumption in adulthood. Seriously, I would not lie to you. Sure, Macaroni & Cheese is one of America’s all-time favorite comfort foods, but I’ve never made it at home and order it in restaurants only on rare occasions when kids (big and little) request it or it is served as a shareable side. What about the lower calorie and fat content? Using only a half cup of low calorie, low sodium Karoun Labne (labneh) Kefir cheese (only 60 calories per 2 tablespoons and a mere 15 mg. of sodium), combined with half a cup of light whipped cream cheese, these two cheeses lend the necessary creaminess to the mac & cheese, leaving the big flavor to French Comté – also known as “Gruyère de Comté”- which has a strong, slightly sweet, buttery flavor that is milder than some of the more “biting” Swiss cheeses of the same family. Comté also melts beautifully – absolutely essential in macaroni and cheese! Total cheese in this recipe is only 1-2/3 cup. In comparison, many mac & cheese recipes call for 3+ cups of sharp cheddar or a combination of cheeses – calories none of us need – especially after being cooped up indoors for much of the winter! We also appreciate Comté’s versatility as an appetizer cheese as it is a friendly pairing with wine, beer, and spirits – and, for my husband’s sake, has about half of the sodium content of other aged cheeses. As far as gluten free, Ancient Harvest Quinoa elbows cooked up nicely, staying firm as long as you don’t over cook the pasta. 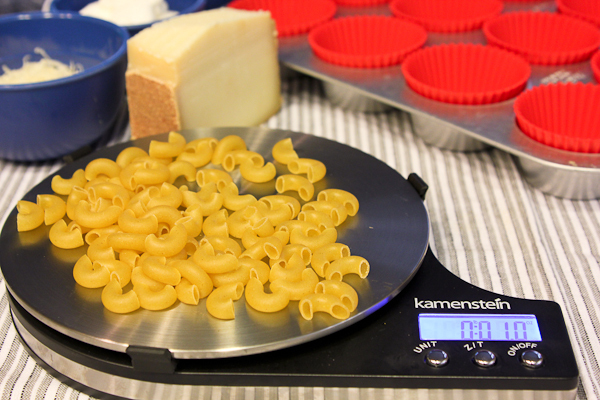 I measured the pasta and used exactly 2 ounces, which has a total of 46 grams of carbohydrates and 4 grams of fiber – divided among 12 servings, that is less than 4 grams of carbs per muffin. Almond flour mixed with paprika provides the golden, crunchy topping, with pistachios adding another layer of texture and more tasty nutrition. The cute little muffins make convenient serving sizes for portion control and are perfect for snacks or lunch at the office. For school lunches, the muffins can be warmed and stored in a thermal cup. But let’s get to the recipe, already! Finally, a macaroni and cheese recipe that is not only gluten free, but lower in carbs, calories, and fat - yet, still satisfies your inner craving for cheesy goodness and crunchy crumblies. Heat oven to 400 degrees. Cut the cauliflower into bite sized florets, add to a bowl. Mix the oil and spice blend. 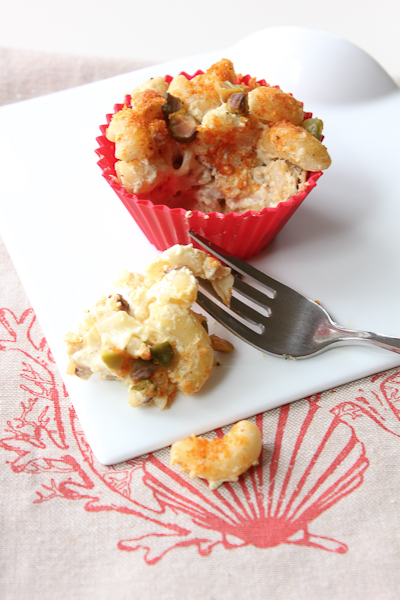 Drizzle over cauliflower and mix with your hands or a spoon to coat the cauliflower. Spread onto a sprayed rimmed baking sheet. Bake for 25-30 minutes. Remove from the oven and, after the florets cool a bit, transfer to a cutting board and coarsely chop. While the cauliflower is roasting, prepare the pasta according to package directions. Drain and set aside. Combine the three cheeses, mustard, white pepper, and nutmeg. In a small bowl, whisk together the milk and cornstarch. Melt the butter in the saucepan over medium high heat, whisk the milk mixture into the butter, continue stirring and cook until thickened. Add the the pasta, cauliflower and cheese mixture to the pan and mix thoroughly. Place silicone or parchment cups in the muffin pan. Distribute the macaroni and cheese mixture evenly into each cup. Combine the almond flour and paprika and sprinkle over the muffins. 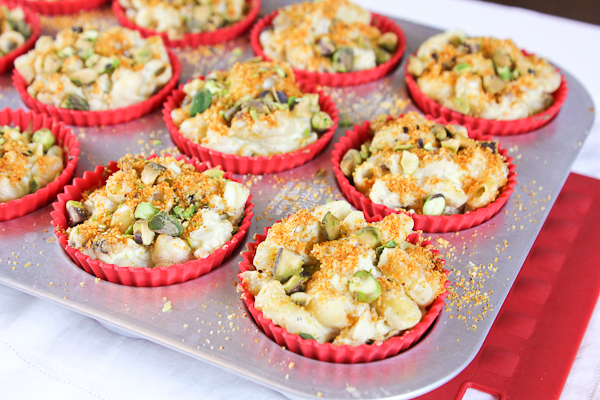 Then top with chopped pistachios. Bake in 400 degree oven for 25 minutes. You'll need a muffin pan and silicone or parchment cups. *I used Karoun Labne Kefir Cheese. Labne (labneh) is a Mediterranean cheese that is available in the dairy section of most grocery stores, but also in Greek or Mediterranean markets. Go on! Take a bite! Enjoy 🙂 And, if you make these, I’d love to hear what you think. Thanks for visiting and have a terrific week! YUM! Now I can definitely get behind this! 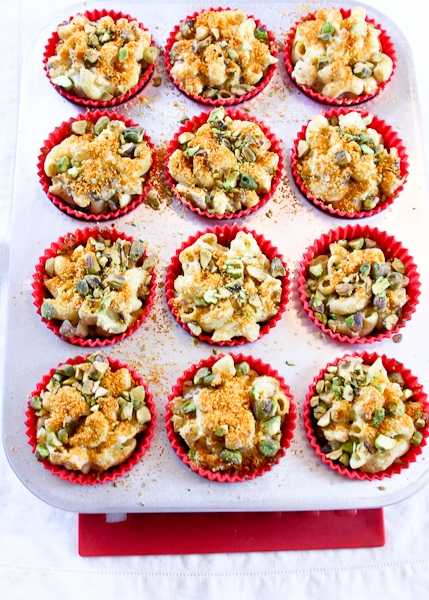 Mac and cheese muffins? Wow kids (and of course adults) would love these! And it’s GF! I like the roasted cauliflower part. Sounds delicious! I love the cauliflower addition! Not to mention that these muffins are low carb. Looks perfect for one of our meatless Fridays in Lent!! I haven’t tried freezing them, so can’t say for sure, I would be afraid they could get a little mushy…but since it’s not too cheesy, it might be OK. These look amaaaaazing! Thanks! I love cauliflower! How very interesting! Have to try this soon!